History goes round and round, handicraft and human thought can barely be told apart; turning and trading past and present is the method used to improve and develop into a future, which will turn into the past before we know it. 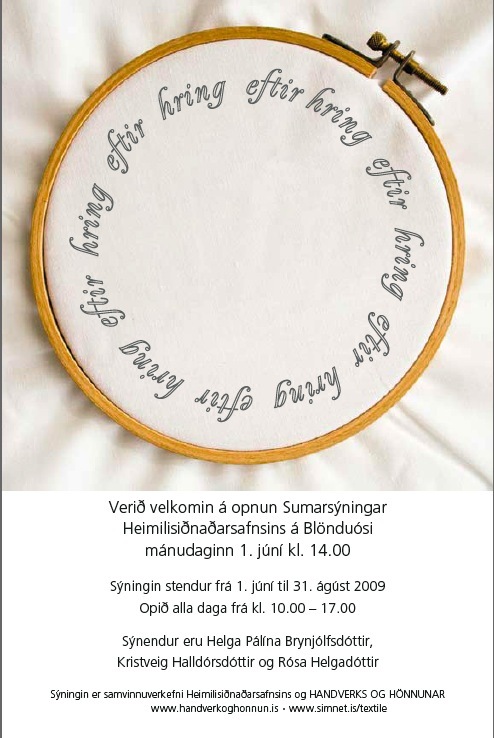 The Textile Museum in Blönduós has the good habit of regularly inviting contemporary textile artists and clothing designers for a rendezvous with the handicraft of earlier times. These meet at the banks of Blanda River. New guests have now arrived to testify yet again about the encounter between new and old, practical and comfortable, which also improves our sense of beauty and new abstract colours, shapes, and methods. The guests are three women, Helga Pálína Brynjólfsdóttir, Kristveig Halldórsdóttir, and Rósa Helgadóttir. No less is needed to take on the heritage so highly valued by Halldóra Bjarnadóttir, who was among other things children’s teacher and principal of the school for processing coarse wool in Eyjafjörður. Textile is a far reaching art form which uses a multitude of fabrics and methods, wool and knit, homespun cloth and embroidery, weaving, textile printing, dye, paint, graphics, and even printing and photography. Many materials are involved that cannot be measured in meters; the technique of the sewing needle is employed, just as much as the computer. The methods range from backstitch to geometry. Settling in to old methods and seeking new subjects, something is always a surprise. How else can we look further and see wider? You constantly need combinations, new “beginnings” of the circle, new presentations to tell us something about the life we are living, just as the permanent exhibits of the Textile Museum tells us so much about the life that has been lived. Embroidery is really a three-dimensional work, a sculpture, a solid with a sophisticated front, and the blood, sweat, and tears of finishing presented on the back: Choice and quality on the one hand, and the unavoidable on the other hand. On the back you can find the beginning and end of the apex, the tangible pattern of the front. Kristveig here offers us a peak into the past through 14 round holes, reminding us of the embroidery loop, the most important helping hand of embroidery. Inside the circles the threads of pattern sneak out of the foggy past into the sharp present, which does not recognize front and back, praises transparency, signs of process and its registration in direct lines. Kristveig studied at the Icelandic College of Arts and Crafts 1989-1993, and later at the National College of Art and Design, Oslo, where she studied textile and fine arts. In the last few years, the camera and computer technology have become Kristveig’s most important creative tools. Using these, she reads her materials – in a sense of the word – picks up and reads texts and creates photos open to interpretation.